Project Art Centre is proud to present this year’s Bram Stoker Festival, the annual celebration of Dublin’s Dark Side, in association with Dublin City Council and Fáilte Ireland. Conceived as a celebration of Dublin-born Gothic writer Bram Stoker and his illustrious novel Dracula, Dublin city will get gloriously gothic this October 23-26. Dublin will be treated to Four Days of Living Stories and Four Nights of Deadly Adventures over the Bank Holiday Weekend. By day, the festival programme presents gothic intrigue at family-friendly events, talks and interactive experiences. At night, the city will embrace the darkness as a host of venues deliver deadly adventures for festival goers in search of macabre thrills and late-night parties. A major festival highlight sees world-renowned Irish street-artist Maser return to the cityscape of Dublin to create an interactive installation in Smithfield, which is inspired both by Stoker’s life and the themes of his most famous work. This must-see event will take place in Smithfield Square where the local community will be encouraged to collaborate in its construction over seven days. The installation will open to the public at twilight on 23 October and will remain open to the public for the duration of the festival. Building on the success of their 2014 appearance, Macnas close the festival at twilight on Monday 26 October. In what is set to be another breath-taking citywide procession from the Galway based spectacle and street performance company; this is a deadly adventure given life on the streets of Dublin. Stokerland will open its gates to families and the young at heart on Sunday 25 Oct. 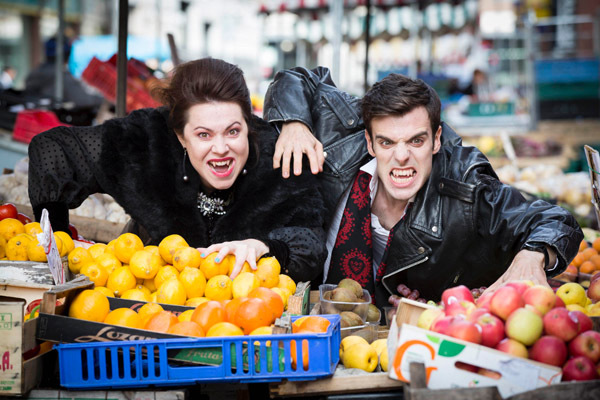 Located in Wolfe Tone Park, Stokerland is a pop-up gothic theme park in the style of the 1900 world fair, featuring the macabre talents of world- class street performers The Mighty Gareth and Able Mabel who will perform on the hour throughout the day. This family friendly fun-day will also offer children and their adult companions gothic makeovers, tin-plate portraits in period dress, screenprinting with Damn Fine Print and Victorian goodies. And the deadliest adventure of all, New Blood, will take place here at Projects Arts Centre on Sunday, 25 October. New Blood is a cold, sharp bite of contemporary Irish culture – a progressive Halloween Party filled with cocktails, art installations, live electronic acts and DJs. Attendees will lose themselves in a futuristic vampire haven and a feast of new blood. Excessive dress-up is essential at this raucous mix of mischief and craic. Dubliners and visitors to the city are invited to follow the fun using #BiteMeDublin and watch out as landmarks and buildings across the city light up in blood red. The festival is an initiative of Dublin City Council in association with Fáilte Ireland. More information on the full line-up of events here.